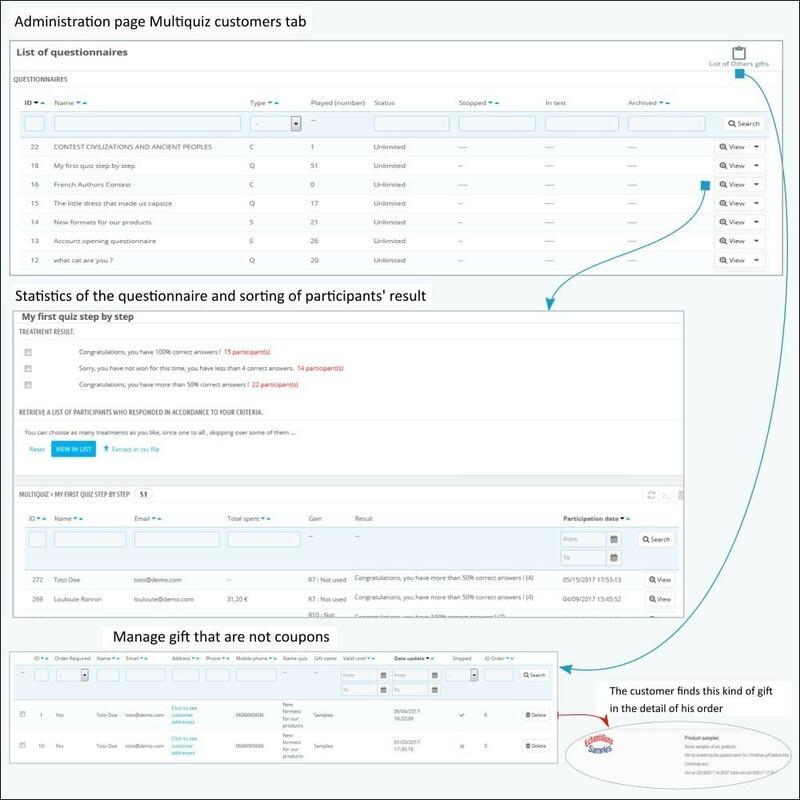 MultiQuiz allows you to create and organize surveys, quizzes, contests and tests, with or without gifts. 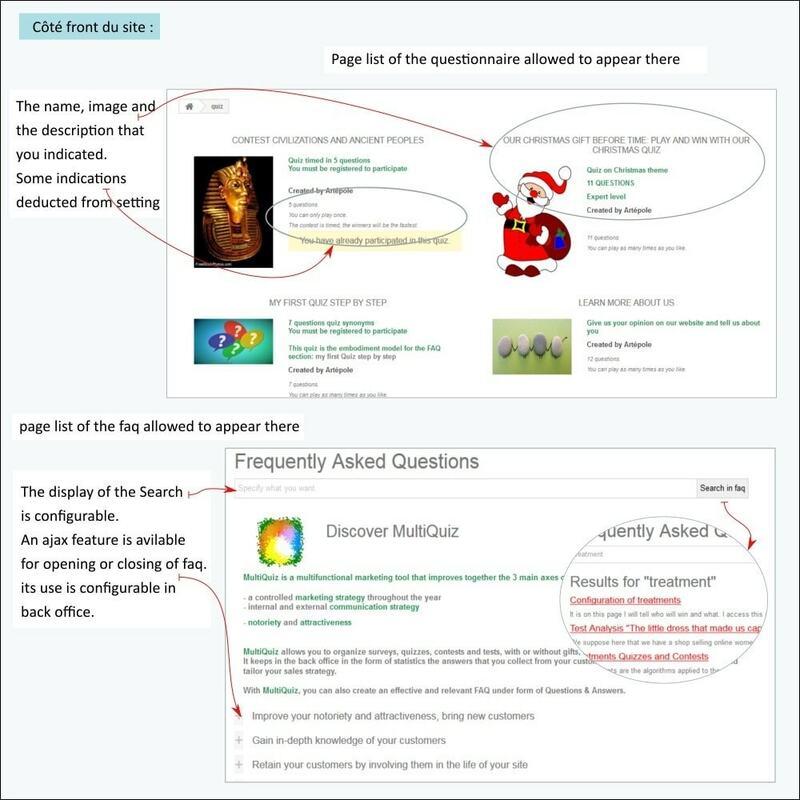 With MultiQuiz, you can also create an effective and relevant FAQ. The games you organize throughout the year allow you to easily create renewed content and relevant external links. You can easily animate all your communication media: home page of your site (in block, pop up, columns), blog, social networks and news letters. 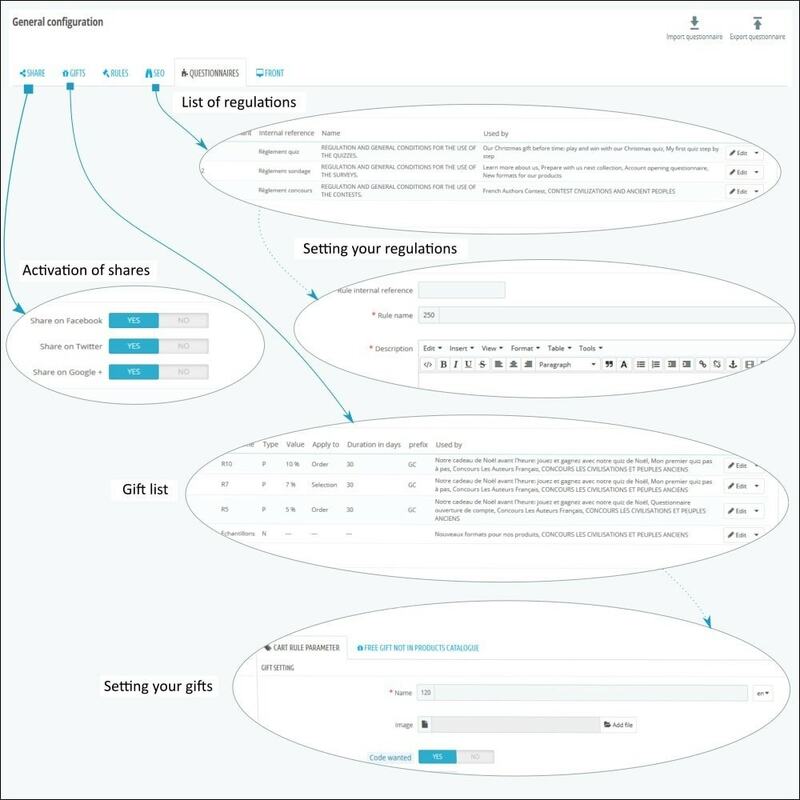 By organizing games with gifts, you can boost your sales at times you choose and attract new customers by communicating on your gaming campaigns. They are valid on all or part of your site, with a date of validity, several options allowing you to parameterize your choices in all clarity. No bad surprises, you know where you are going! Their nature, amount, and any restrictions you choose are displayed to the participants prior to the start of each game. 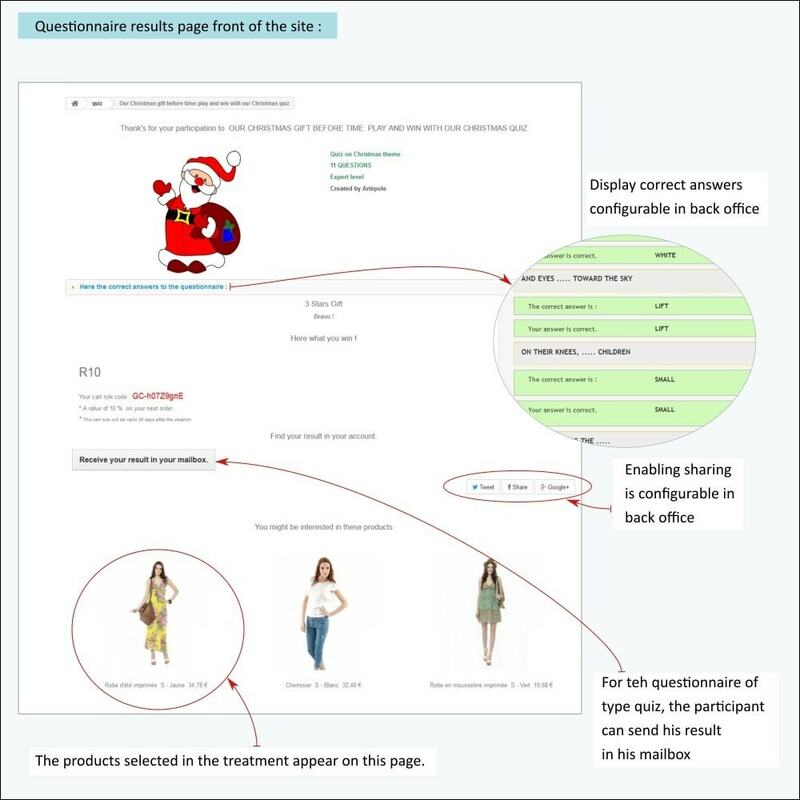 MultiQuiz also allows you to highlight products from your shop. You just have to select them so that they appear in the results pages at the end of each quiz or test. There are a lot of features, here are a few. 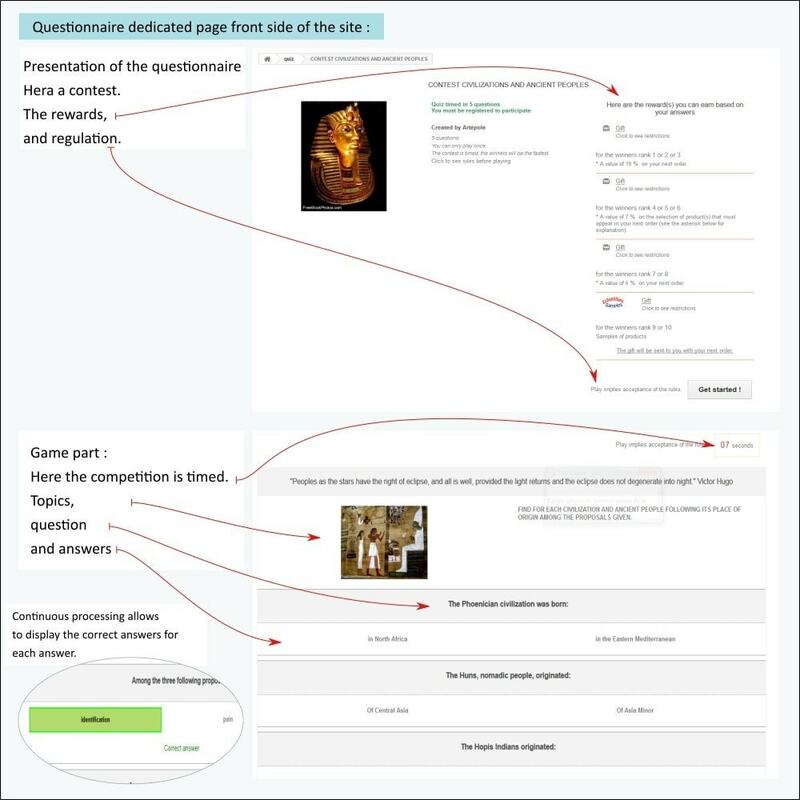 MultiQuiz is a module for creating questionnaires used to create quizzes, surveys, contests and faq. Each questionnaire quiz, survey or contest can be set to distribute gifts (coupons, ...) in thanks for the participation or to reward the winners. 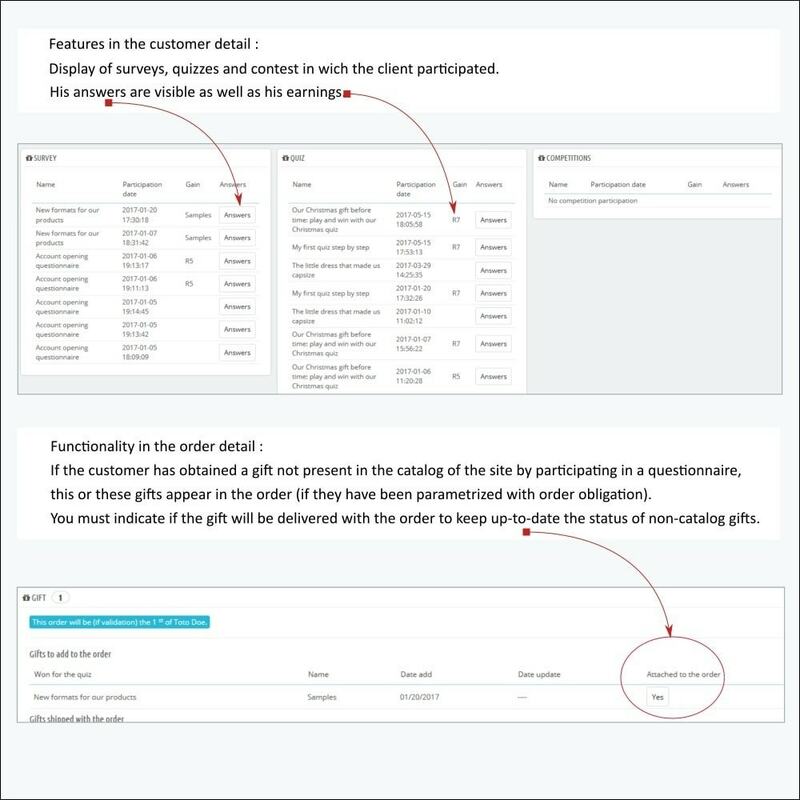 It is possible to highlight products that you have previously selected in the result page or the thank you page for participation. 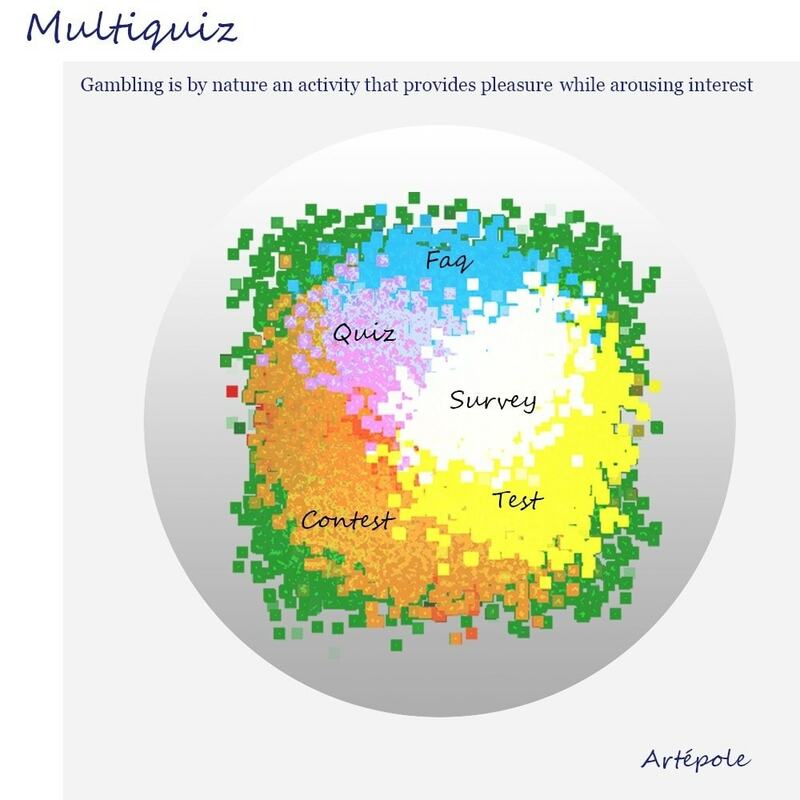 From the result page, quizzes, surveys and contests can be shared on social networks. 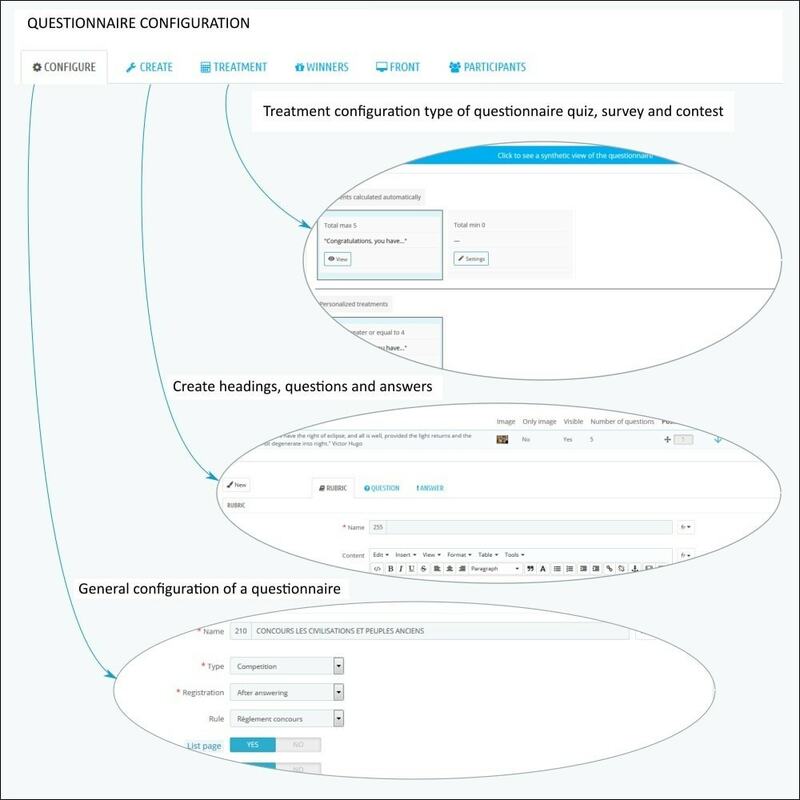 A keyword search is available for questionnaires of type faq. 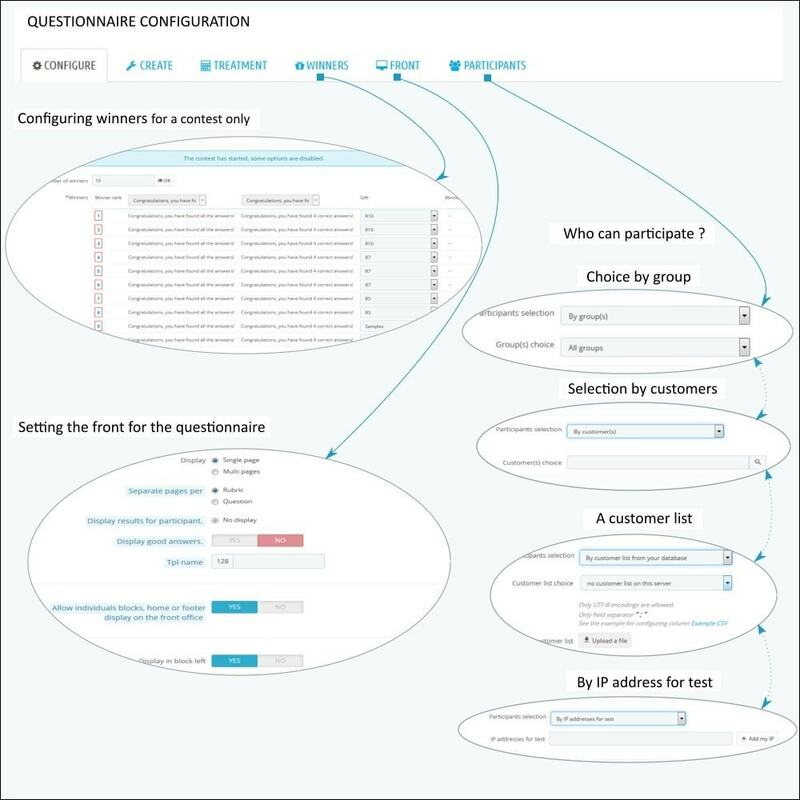 The statistics of the participations by quiz are available in a dedicated administration page, with possibility of sorting and recovery of csv result file of sorting for emailing. You have access to the answers of your customers in their card in the administration. 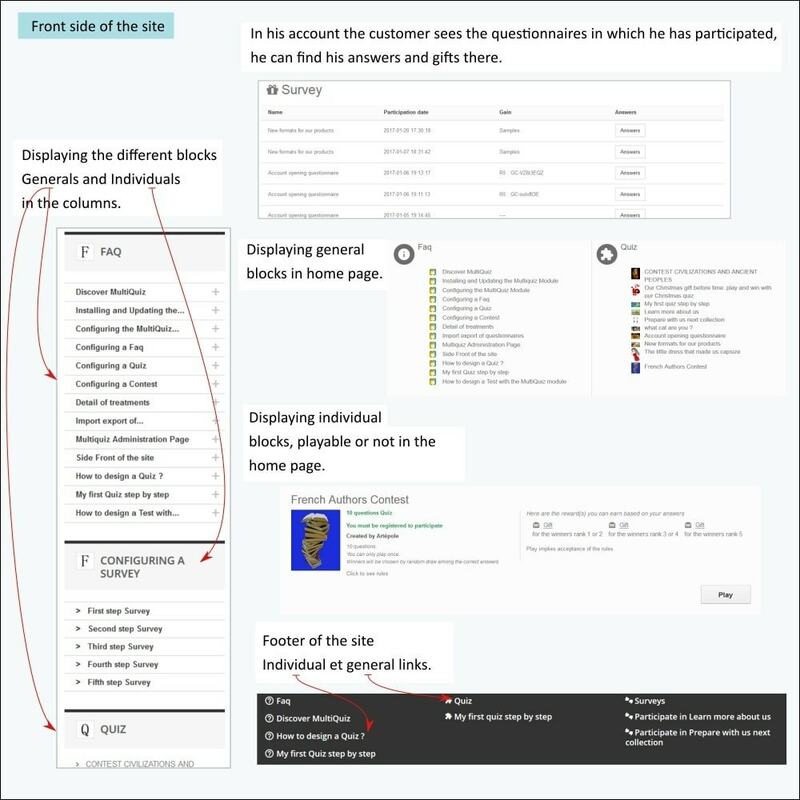 The customer has access to his answers by quiz in his space "My account". Gambling is by nature an activity that provides pleasure while arousing interest. It brings a welcome relaxing moment. When they have a reward (voucher on your site, discount in percentage, free delivery ...), they are perceived as a challenge of which the gain is readily used. They have the ability to attract a wide and varied audience. The front office is based on the default theme of Prestashop and therefore uses Bootstrap and Jquery. 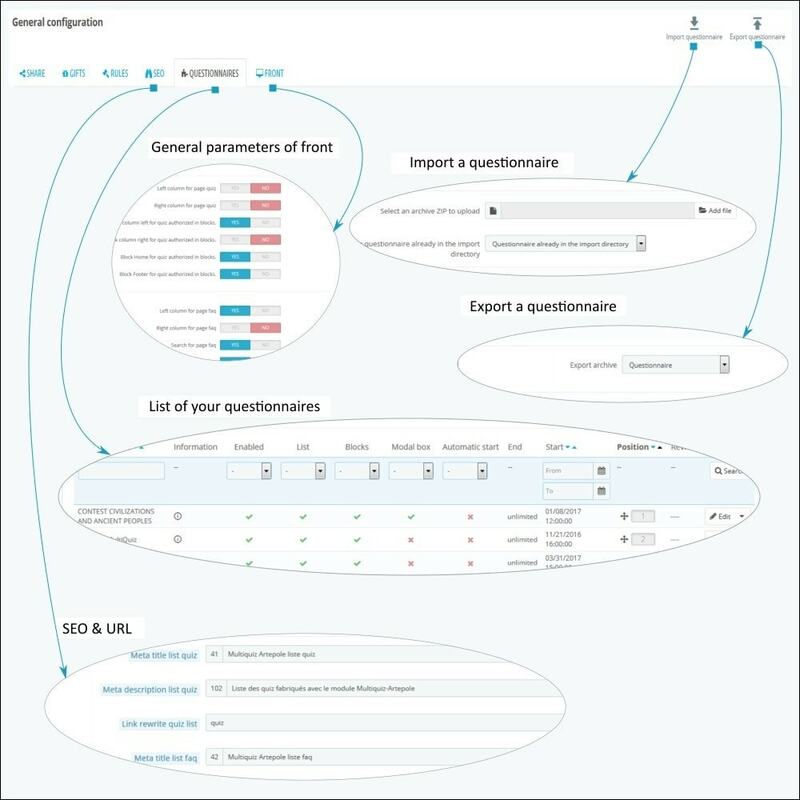 If your theme does not use Bootsrap and / or Jquery, some changes will be required for optimal viewing. The installation is classic under Prestashop. For the parameterization refer to the complete documentation.